All authors with blogs are welcome to participate. This is a simple answer… I have little to no experience with the big contests because I don’t enter the kind of contests this topic refers to. As I write this, I do remember entering a contest to win a wedding ring for my (ex) husband. Of all things, you had to write the reason why he deserved it. I didn’t win, but I poured my heart out and wrote about all his good traits at being a husband and father. They were true. Another time I had entered a short story contest. Many of you have heard me say I’m not good at writing short stories. One day I’ll see if there is anything I can do with that one because I think it can turn into a longer story. Oh, I entered a poetry contest. My poem had been accepted. Yay! I’m sure most entrants had been accepted. Why? Again, I’m almost sure the sole purpose of this contest was to get entrants and their families to purchase the anthology. I don’t have proof of this, of course, but I’m assuming. Back then I was naïve and didn’t care. Yes, I purchased the book. Wouldn’t you? How about you readers? Tell us about your contest experiences. Don’t forget this is a BLOG HOP. Come along with me to see what kind of contests the other participants have entered. Rock on! Enjoy your weekend. 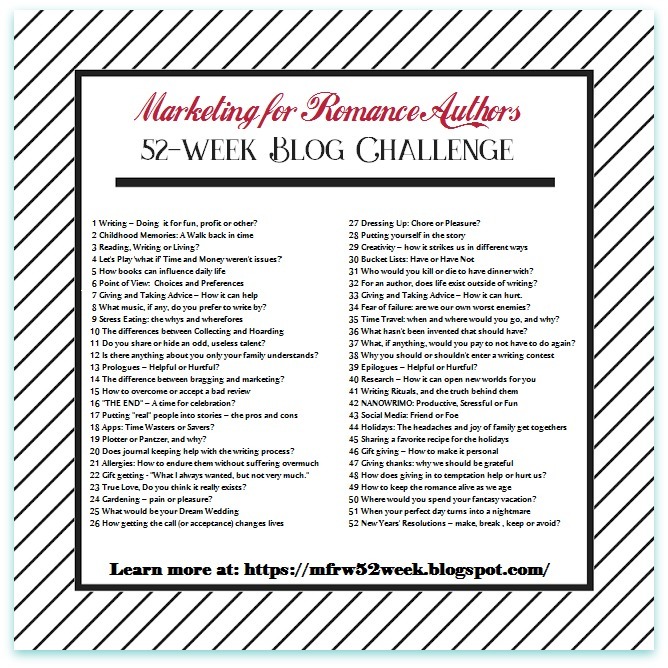 This week I’m not adhering to the topic for Week Seven in the 52-Week Blog Challenge Blog Hop. Last year we had a topic about our Bucket List and this week’s topic is Top Five Things on my Bucket List. Here’s the link to last year’s Bucket List post if you’re new to my blog and want to check it out. Instead, this week I’m going back to our 2018 Week Three topic, which is a week I missed this year. Week 3 How Much of Myself is in my Writing? Photography: Photography is my long-lost hobby. You’ll find many of my characters taking pictures even if it’s one brief shot, or they might say, “I forgot my camera!” One hero will take a picture of his subject and oftentimes paint or draw from the picture. Poetry: A recent hero came to me as a poet. In my early years I called myself a poet. It’s been years since I’ve written a poem or had the urge to do so. It seems certain circumstances have to be at play in my life for my muse to write poetry. Fear of Heights: The heroine in my current WIP has a fear of heights. Huh, who me? Flying: Yes, like me, I do have a couple heroines who do not like flying. They break out into a cold sweat before take-offs and landings. I, on the other hand, do like the take-offs but landings are meh. It’s being in the air that I don’t like. Highways. Bridges. Mountains. Don’t judge. 🙂 I don’t like driving on the highway (anymore), over bridges, or in the mountains. I make sure my heroines DO NOT have this issue. I walked across the Mackinac Bridge, and the Blue Water Bridge from Michigan to Canada, but I wouldn’t be able to drive over them. Reading: Some characters will be shown with a book or an eReader. Even rugged Zach Bryson in Finding Kimber has a stack of books beside his bed, and he’s read one that Kimber mentions. Close-knit Family: I’ve strived to have a close relationship with my two boys and their girlfriends and/or wives. Not that they have a girlfriend and wife at the same time. Thought I’d get that straight. The men in my books who have a mother, have a great relationship with her. That doesn’t mean they agree on everything. If you know, Judy, my Double Dutch Ranch matriarch, you know what I mean. One of my heroines doesn’t have a good relationship with her mom, but she does with her mother-in-law. Thanks for visiting today. Remember this is a BLOG HOP. 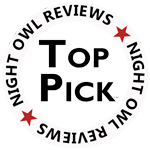 Let’s visit the #MFRWauthor participating authors who did stick to the topic of the week– Top Five Things on my Bucket List. I’m curious because I know how hard it was to come up with my list last year. Thanks to Pixabay for the images. I’m sure I took the shot of the plane wing. Guess what else is going to inspire me today? YOU are. Won’t you let me know what inspires your muse, or inspires you in general to do what you do? Some of you are photographers. What makes you take that special picture I see posted on your blogs? It calls to you, doesn’t it? Why? Writers? Cooks? Wine Connoisseurs? Poets? Friends? Musicians? Readers? Soldiers (Military)?